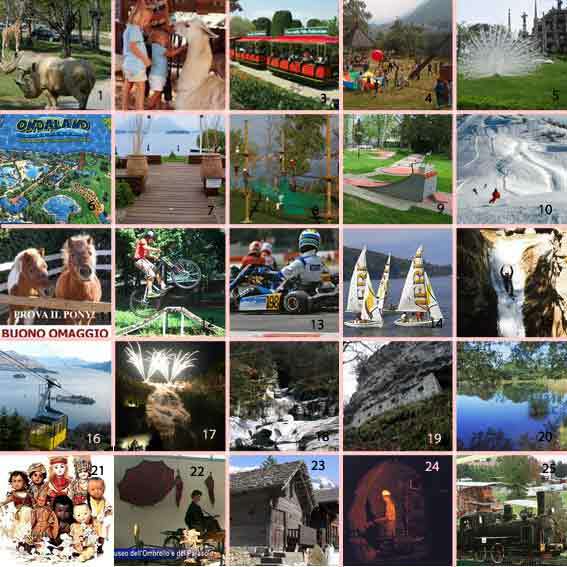 Varallo Pombia – Fantastic amusement park where it is possible to take a safari through the wild animal park, either in your car or in the minitrain and view the lions, rhinoceros, hippopotamus, siberian tigers, giraffes and perhaps even the “white lion”. For the younger members there is a farm yard where they can touch the cows, donkeys, geese, and pigs. There is also an area where children can experience a pony ride and watch a spectacular show of falconry and visit the condors, owls and even an eagle. For the insatiable there is a dinosaur park, an acquarium and a reptile park. To finish off there is also an area with rides, waterslides, dogems and minigolf. Everything for the perfect family day. www.safaripark.it March-October daily 10-17.00 November-February only weekends 10-17.00 Entry € 17 Children 5-13 €12 Remember to go online and download the discount coupon €3 per adult and €2 per child up to maximum of 5 people in a car. Ondaland attached to the Shopping Outlet at Vicolunga, Biandrate is a marvellous placet o spend a sunny day. There are special areas for young children, teeneagers and adults with water slides, hydrotubes, Happy Boats and Foam. Sunbathing and Spa sectors as well. www.ondaland.it Opens 29 May Entry €20 adults, €15 children under 12. Take the family to the Adventure PlayGround in Baveno and let them loose on the wide range of exciting and testing corse. Tibetan hanging bridges, ladders, swinging platforms, absailing, all in complete safety thanks to modern equipment. There is also an artificial free-climbing wall, and try out the acro-jump, trampoline jumping in a safety harness for ease of turning somersaults. There are three courses which cover all ages: Mini Junior for children up to 110cm; Junior for children with a minimum height of 110cm and Top Adult for everyone over 140cm. PreBooking is advisable given that the Course is sometimes booked out by Groups. Entry: Adults €24, Juniors up to 140cm in height €17.www.lagomaggioreadventurepark.com open from 10-19.00 May to September, weekends the rest of the year. An afternoon playing MiniGolf, an inter family competition where anyone can win thanks to skill or a lucky stroke. Chose from Orta (near the Car Park at the entrance ) Tel. 0322.90445 or Dormelletto where the Sempione MiniGolf is in Corso Cavour. Winter skiing in the area is extremely varied. Choose from the different localities Mottarone, Macugnaga, the Val Formazza, the Piana of the Val Vigezzo, the Alpe Ciamporino in San Domenico, the Lusentino above Domodossola. All within an hour’s drive from the Lake and all offering excellent lifts and a wide variety of pistes . Mottarone, 20 minutes from Castello Dal Pozzo, has an excellent children’s ski school, and it is possible to hire all the equipment on the slopes. www.neveazzurra.it www.mottaronesci.it and www.scuolascimottarone.it/ Season from December to April. Le Marmotte Ski School 2 hour Lessons €30 + €6 for the ski pass. The Castello Dal Pozzo www.castellodalpozzo.com is the perfect base for those who like biking. It is possible to hire bikes for the period of your stay or bring your own and keep it in the bike room in the Hotel. Excellent excursions of all lengths and difficulties: all round the Lake, through the Park of Lagoni, inside the Castello grounds. There is an excellent MX track in the Adventure Playground at Baveno, and they frequently hold special courses for the younger children. You can take your own bike or hire one there – helmets obligatory. Entry: Adults €24, Juniors up to 140cm in height €17.www.lagomaggioreadventurepark.com open from 10-19.00 May to September, weekends the rest of the year. Hire a Go-Kart Honda 4 stroke 200cc and 6,5 horsepower, which will allow the aspiring racing driver to reach a speed of around 60km on the straight. An ideal way to spend an afternoon, especially if there is a group of youngsters that can compete against each other. Add a cup for the winner and the day’s success is guaranteed. Kart hire : Weekdays (closed Monday) from 14.00 – 19.00 Weekends 18.00 – 19.00 June-September 21-24.00 except Sundays www.pistazzurra.it Cost of hire €10 for 7 minutes. Piero Chiara writes in his novel The Bishops Room: “The sight from the lake is beyond description. You cannot conceive what the banks are, seen from offshore, a villa after the other, rivers, streams, waterfalls flowing from mountains, the towns”. Why not experience this for yourself and your family by hiring a boat for the day? Or hire a sail boat for a day or two. The Windy Waves base in Angera offers SunOdyssey 32 – 9.6mt sailing boat or a Freeway 21ft 6 seater cruiser. www.windywaves.com . During the summer the various yacht clubs round the lake hold sailing lessons for youngsters. Ask the hotel concierge for more information. For the more adventuresome and for teenagers who like extreme sports, the area of the Valsesia offers a range of activities from kayak to rafting, hydrospeed, canyoning and tubing . www.monrosarafting.it Balmuccia (VC) . Try two different activities in one day for €80. A day out to view one of natures spectacular works of art. At La Frua (1861 m a.s.l. ), the Formazza Valley offers what is considered to be the “Alps” most beautiful leap”: The Toce Waterfall. The waters of this sensational natural display launch themselves into the void from a height of 143m and reach a width of 60 meters at the base. Easily reached via road, direction Domodossola, the journey will also take you through the important spa centres of Crodo, Baceno and Premia before reaching the Valle Formazza and La Frua. The waterfall can be visited during summer, from the end of June until September every Sunday morning, Saturdays (not fixed) and during the August holiday week. During summer there are also weekly openings, which vary from year to year. The waters are most spectacular viewed from the wooden balcony. The Glaciology Park of Valle Antigorio is a unique scenario… a mix of narrow canyons, ravines, and crevasses created by water erosion. One of the most fascinating excursions is to the Orridi di Uriezzo. The orridi are very deep and narrow canyons created by subglacial water erosions. During the Ice Age, a very large glacier covered the area. When the glacier started to melt the water dug deep furrows as it moved downhill. The distinctive feature of the Uriezzo Gorges is that since water no longer flows through these narrow and deep incisions in the rock, it is possible to walk inside three of them. The most spectacular spot is undoubtedly the South Gorge, which is about 200m long and between 20 and 30m deep and which is called “the Tomba d’Uriezzo” (The Uriezzo Tomb) by the people of the area. Signboards and metal stairs guide the visitors. The “marmitte dei giganti” are also the result of water erosion. You can see these spectacular rock formations in the shape of giant cylinders along the Toce River. The Orridi are reached by car via Domodossola, and Baceno. Recommended trekking shoes. A day’s trekking following the Cadorna Line built along the lines of the Maginot line in France during WW1. Start out from Piancavallo, inland from Oggebbio, and follow the fortifications, bunkers and trenchs built to defend the area from a hypothetical german attack via Switzerland. Morissolo, Colle, Monte Spalavera and back via Pian d’Alpe. 5 hours of easy trekking sure to hold the attention of everyone, given the variety of things to explore en route. www.gustoamonte.it/eng/ for a descrition of various treks and a map of their location. Lake Maggiore offers a variety of Parks and Wilderness areas. The Lagoni Park at Mercurago, at the sothern end of the Lake, covers an area of 450 hectares, and is easily reachable on foot from Castello Dal Pozzo. www.castellodalpozzo.com. The wet areas of the Park, together with those of the adjoining La Torbiera Park, are home to a large variety of flora and fauna. It is possible to see squirrels, foxes, hares as well as ducks, moorhens, herons, and eagles, all attracted by the ponds in the Park. http://www.parks.it/parco.lagoni.mercurago/ Open from March to December. Macugnaga in the Anzasca Valley. This mountain village is a perfect example of the Walser culture. The Walsers, of Germanic origin, settled in the Valley almost 10 centuries ago. Take the chairlift to the Belvedere at 1200mts, the start of a short Trek to the Glacier, or visit the Walser Museum . Pleasant day out and plenty of places for lunch. Combine with the Gold Museum.